What is the Difference Between a Bathymetry Chart and a Hydrographic Chart? This article will immerse you into the deep water of Bathymetry. It explains in detail what a bathymetry map is, what it shows, what methods we use to collect the bathymetry data and last but not least, how to create a good quality bathymetry map. It will also cover the difference between a bathymetry chart and a hydrographic chart and the techniques our ancestors used in the past to collect and record depths? Bathymetry is the study of mapping the seafloor. Bathymetric maps represent the ocean (sea) depth as a function of geographical coordinates, just as topographic maps represent the altitude of the Earth's surface at different geographic points. On topographic maps, the lines connect points of equal elevation. On bathymetric maps, they connect points of equal depth (Figure 1). The name derives from the Greek words: βαθύς (bathus), ’deep’, and μέτρον (metron), ’measure’. The general purpose of producing Bathymetric (or hydrographic) charts/maps is supporting the safety of surface or sub-surface navigation and usually displaying seafloor relief or terrain as contour lines called isobaths. A bathymetric chart differs from a hydrographic chart in that accurate presentation of the underwater features is the goal while safe navigation is the requirement for the hydrographic chart. A hydrographic chart will obscure the actual features to present a simplified version to aid mariners in avoiding underwater hazards. Illustrating the depths on a bathymetry map combines different methods such as using a Digital Terrain Model (DTM) or artificial illumination techniques . Like geographical maps of the surface of Earth, bathymetric maps are designed also in cartography projection. Generally, the projection used most often in bathymetric maps is the Mercator projection. It has been used for a long time to produce sea charts that are used for sailing in all latitudes except Polar ones. What is the Bathymetry Data Used For? Biological oceanography, defining the habitat for benthic (bottom-dwelling) organisms. How did We Collect the Bathymetry Data in the Past? There are various methods to collect bathymetric data. The first officially recorded depths were entered into log books and sailing guides (’rutters’), and then in 1584, the first depth chart was produced by the Dutch. Early techniques used pre-measured heavy rope or cable deployed manually into the water (Figure 2). The crew of the ship had to ‘feel’ when the rope hit the seafloor and then record the current depth. That method was quite inefficient, incorrect and incomplete because the rope often did not travel straight to the seafloor but was shifted by currents. The surveyors were also measuring the depths only to a single isolated point at a time and thus, until the next measuring, missing possibly significant features like underwater hills or trenches. For instance, the most important structure in the Atlantic Ocean, the Middle-Atlantic ridge, was discovered and began to be investigated only after World War II. This method is also subject to steady movement of the ship (heaving, rolling) due to waves and currents and therefore also quite inaccurate. For safe navigation, all that is needed is the minimum depth, so at the beginning of the 19th century, drag wires began to be used in coastal waters (Figure 3). A drag wire is strung between two vessels, with supporting buoys in between, that are at a known depth. If this can be taken safely along a channel, then it is known that the minimum safe depth for navigation is the depth of the drag wire. From the beginning of the 19th century, European States also started setting up national Hydrographic Offices to provide charts to support their navies, as they had poorer charts than merchants who bought charts from commercial publishers . What Techniques Do We use Today to Collect Bathymetry Data? Starting in the early 1930s, SBES produced a single line of depth points directly under the equipment. During a bathymetric survey, the echo sounder system is mounted on the hull of a survey vessel and measurements are made while the vessel is moving to identify general seafloor patterns or fish schools (Figure 4). The sonar system sends out multiple soundwaves that bounce off the seafloor and return to the ship. The delay between sending and receiving the signal provides a measurement of ocean depth. These measurements are then used to produce a map charting the seafloor (bathymetric map). Figure 4: The sonar system mounted on the hull of the vessel sends out sound waves that bounce off the seafloor and return to the ship. Most commonly used method. The principle is the same as the SBES, except that equipment uses hundreds of very narrow adjacent beams arranged in a fan-like swath of typically 90 to 170 degrees across to acquire multiple depth points over an area. This method produces high-resolution data and accuracy (Figure 5). Like the MBES, it derives the data by acquiring multiple depth points through a wide swath angle, but it is mounted on an airplane. The amount of time it takes for the sound or light to travel through the water, bounce off the seafloor, and return to the sounder informs the equipment of the distance to the seafloor . As with the MBES method, the Lidar technique obtains very high-resolution and accurate datasets. 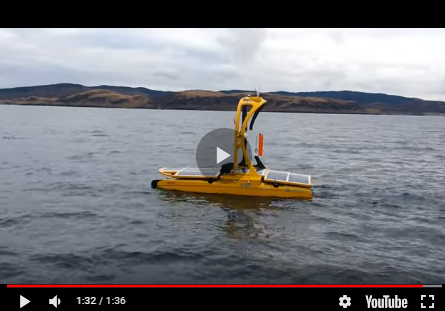 This method is quite new and relies on public volunteer vessels recording position, depth and time data using their standard onboard navigation instruments. The data is then further uploaded to crowdsource organisations such as OpenSeaMap, TeamSurv or ARGUS and further post-processed for tidal corrections or speed of sound. This approach does not require a specific survey vessel, or professionally qualified surveyors to be on board but it cannot substitute a rigorous systematic survey, where this is required. Nevertheless, the results are often more than adequate for many requirements where high-resolution or high-accuracy surveys are not required or are unaffordable . What Else is Important to Create a Good Quality Bathymetry Map? To the various different methods, we have to add some extra bathymetry equipment that helps acquire more accurate and reliable data. Gyrocompasses with an accurate heading provide information to correct for vessel yaw, and attitude sensors help correct roll and pitch on the ocean surface. The modern MBES systems have an integrated motion sensor fixing the correction errors and a mounted GNSS that positions the soundings with respect to the surface of the Earth. During the surveying process, supplementary measurements for factors such as water salinity, sea temperature and ocean depth need to be made due to the refraction of ‘ray-bending’ of the sound waves owing to non-uniform water column characteristics. These factors affect how quickly sonar waves travel through the water. The most significant device that measures the propagation velocity of the acoustic wave within the water column is called Sound Velocity Profiler (SVP). In general, sound travels faster as temperature, salinity and pressure increase. The ocean has different currents, with different temperatures and salinities. A sensor recording that data is named CTD (Conductivity, Temperature, Depth). When processing multibeam bathymetry data, corrections for those factors need to be made in order to get high-quality data. To construct a precise map of the region, it is necessary to perform surveying in such a manner that map stripes, obtained in different vessel tracks, are as close to each other as possible, or even overlap. In deep waters, we use low frequencies instead of high frequencies, so that the acoustic waves reach the seafloor. The low frequencies do not produce a good resolution of the data. The deeper the water, the greater the area the beam covers. That is due to the swath opening angle. However, the outer beams of the swath create poorer returning signals and therefore lower resolution data. Finally, hydrographic processing software processes all the data. The resulting sounding measurements are then processed either manually, semi-automatically or automatically (in limited circumstances) to produce a bathymetry map of the area. After performing such surveying, all the data is joined together, and the map of the entire region is constructed . As mentioned above, after the data has been collected, it has to undergo post-processing. The amount of data collected during a hydrographic survey is massive, often with several soundings per square metre. Depending on the goal for which the bathymetry map will be created (for example, navigation charts, Digital Terrain Model, volume calculation for dredging, topography, or bathymetry), this data must be reduced. The data will also need to be corrected for errors (i.e., bad soundings,) and for the effects of tides, waves/heave, water level and thermoclines (water temperature differences). The final output of charts can be created with a combination of speciality Hydrographic Processing Software or a computer-aided design (CAD) package. Hydrographic Processing Software is designed to process hydrographic data. Hydrographic Acquisition Software allows for the creation of bathymetry maps, target detection, a difference analysis between new and old surveys as well as many other features for a wide variety of applications such as removing outliers, plotting field sheets, exporting data to CAD, computing volume quantities, generating contours, creating side-scan mosaics, etc. It must be remembered that no map is a real model of the world, but has been created to meet the needs of the intended user. Bathymetric nautical charts are no different in this respect. Firstly, they are mostly planned for the safety of navigation showing the shallowest depths in an area, which is great for navigators but does not meet the needs of many other users who want a more balanced view of the depths. Secondly, they were constructed and intended for marine sailors to plot their tracks on, which means that the amount of information shown beyond that needed for safe navigation is limited. Digital charts would overcome the problems of displaying less data on the paper maps, but most digital charts are still basically just facsimiles of the paper charts and have yet to use the benefits that a digital approach could offer. This may change with the S-100 series of standards for digital charts, but these have not been implemented in commercial products yet . Finally, whilst the preponderance of GPS for positioning means that most charts have now been redrawn to the WGS84 horizontal datum, vertical charts refer to a local sea level. Nowadays, there is still a big variety in choosing the right vertical datum. Some states are still using datums like Mean Lower Low Water (MLLW) in the USA and not the Lowest Astronomical Tide (LAT) or Mean Sea Level (MSL) in areas with minimal tidal ranges as recommended by the International Hydrography Office (IHO). However, this is not a big issue for navigation but makes it difficult to set any sort of global mapping to a common vertical datum. The taking and analysing of bathymetric measurements, as well as the creation of bathymetric maps, is one of the core areas of modern hydrography, and a fundamental component in ensuring the safe transport of goods worldwide. Overall, very little is known about the seafloor; less than 8% of the Earth’s waters have been mapped. Even the surface of Mars and Venus has been better mapped than the Earth’s seafloor. The existing maps of the seafloor are often low-resolution maps, mostly derived from satellites and only provide a general indication of water depth. Therefore, great efforts will need to be made in the future to change this. 5"Hydro International: Water Depths by Crowdsourcing"(PDF). openseamap.org.